Cable TV service is activated in every dorm room, SLU, and Fraternity* when you arrive on campus. You may obtain a cable for hookup from the outlet to your television. These cables are available from most department stores and Radio Shack. 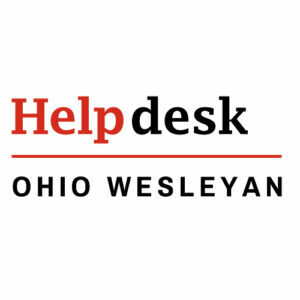 If you would like the University to provide the cable from the outlet to your TV, please email the Help Desk at helpdesk@owu.edu. These will be provided at no charge on a first-come, first-served basis. Due to the new cable TV system installed during the summer, older TVs that lack a digital QAM tuner will not be able to pick up all the channels. Most TVs made prior to 2006 are not HD-ready and even some newer TVs lack a digital QAM tuner. For example, some new Element and RCA models are not QAM capable. You can use an HD QAM set-top box as a converter box and run the signal from the wall plate through the set-top box to the TV. Ohio Wesleyan’s cable TV service is available in all residential halls, small living units and fraternities*. You must have a cable ready TV to receive all of the channels below. There are a number of digital channels that are simulcast on our system. If you have a digital HD TV, you can scan for these channels using the auto-program feature in the menu/channel settings. ** The number and placement of these depends entirely on your specific TV’s tuner. Not all TV’s will receive the same digital/HD channels. * ChiPhi has a basic analog package from Time Warner Cable and is not part of the OWU system.